and pastoralia. Like many of the other works in the series, they represent an Erasmus that, despite the recent growth of interest in him, has remained largely unfamiliar-the Erasmus of the works 'pertaining to the pietas. 'Volume 69 is special in that it contains seven examples of a genre important to Erasmus, the genre of prayer. The prayers here include an effusive and lyrical early triad, a 'paraphrase' entitled The Lord's Prayer, the highly formalized Liturgy of Loreto, the heartfelt Prayer for Peace in the Church, and a collection of short prayers published the year before Erasmus' death. The volume is special also in that it contains many pieces about women, prompted by women, or addressed to women. Among these are A Comparision of the Virgin and the Martyr, Letter of Comfort in Adversity, and the Marian prayers, all of which directly or indirectly treat the subjects of virginity and marriage.The longest piece, The Institution of Christian Matrimony, is a work of towering importance in the history of writing on marriage. 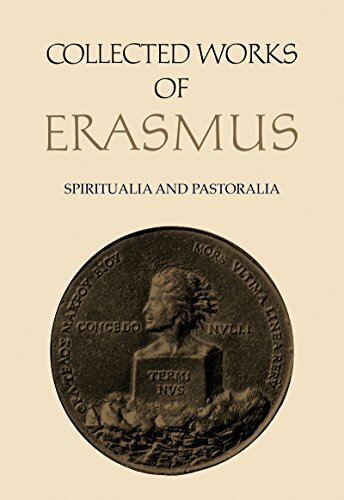 In the words of the translator, Erasmus has written a treatise 'profoundly serious and deeply researched ... a detailed and painstaking examination of the institution from every conceivable angle. 'Professor O'Malley's introduction provides background and context for each of the selections, and emphasizes Erasmus' subtle but influential refashioning of the genres in which he wrote.Volume 69 of the Collected Works of Erasmus series.